Welcome to our very first sketch of May! Let's embrace a new month of creativity. Below you'll find Sketch 279. Create cards, scrapbook layouts, home decor, treat containers, mixed media, etc. using this week's sketch and be sure to link your project below for a chance at the weekly My Favorite Things Gift Voucher worth up to $20. Join me in welcoming Rubeena Naz as our Guest Designer this month! 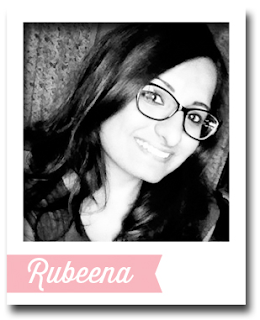 The rectangle of the sketch is a great place to create a window on your card, and Rubeena's window looks at a colorful rainbow! 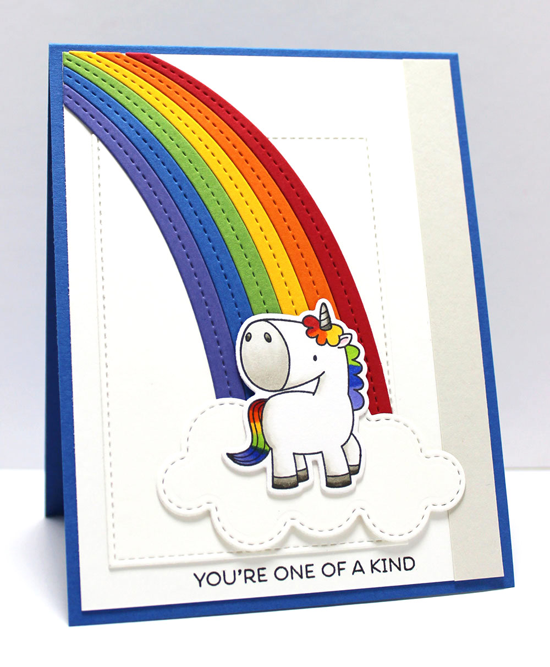 The cloud from the End of the Rainbow Die-namics is the perfect spot for a sentiment, and the shy unicorn from the brand new Magical Unicorns stamp set looks lovely with a blue mane. The My Favorite Things Creative Team has been busy getting creative! Let's see what they have up their sleeves for Sketch 279! Julie took some liberties with the sketch, but the result is delightful! She turns it on its side, and the line on the right is represented by the striped patterned paper at the bottom. Instead of a rectangle, she substitutes a bold red star, and I love how the Stitched Speech Bubble Edges Die-namics creates a fun edge for her card front. 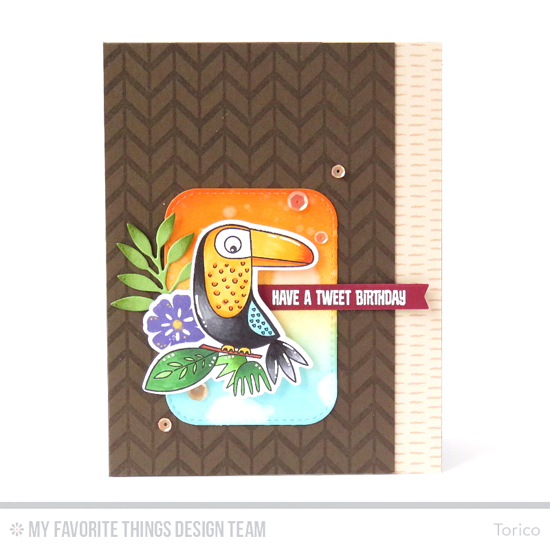 Torico adds interest to the background with the Lined Chevron Background stamp, and uses the rectangle to feature one of the fabulous Birds of Paradise. Her colorful background and mix of greenery add to the wild nature of her design. 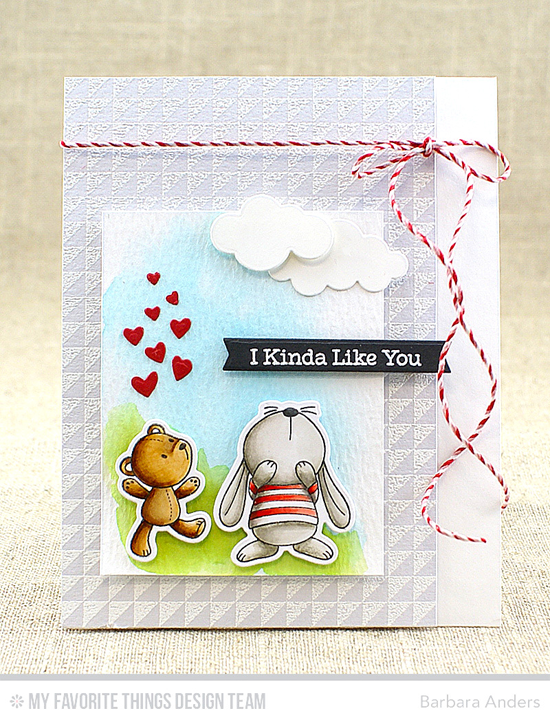 Julie's card follows the sketch quite closely, and it is filled with color and sweetness! 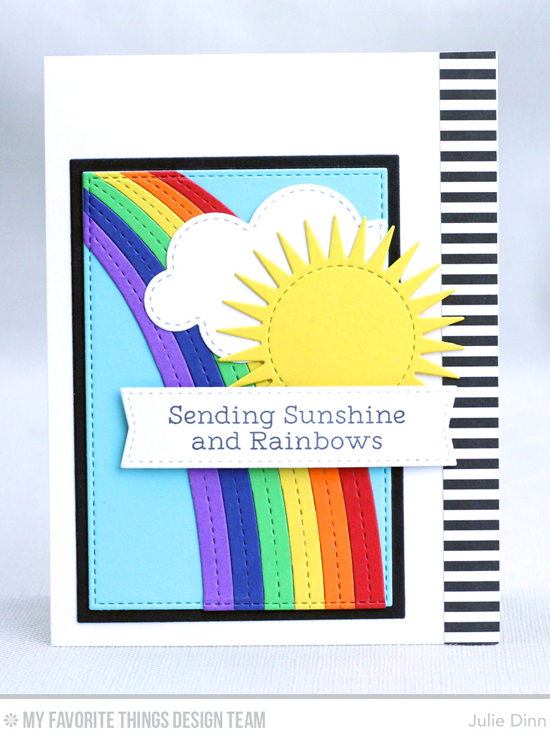 The cheery rainbow and Radiant Sun Die-namics create a super encouraging card for a friend who might need a pick-me-up. I love her finishing touch of the striped paper on the right. Barbara couldn't wait to feature the adorable Snuggle Bunnies stamp set, and this sketch was the perfect avenue to do just that! The Split Triangle Background stamp sets the scene in the background, and baker's twine and sweet red hearts complete the design nicely. 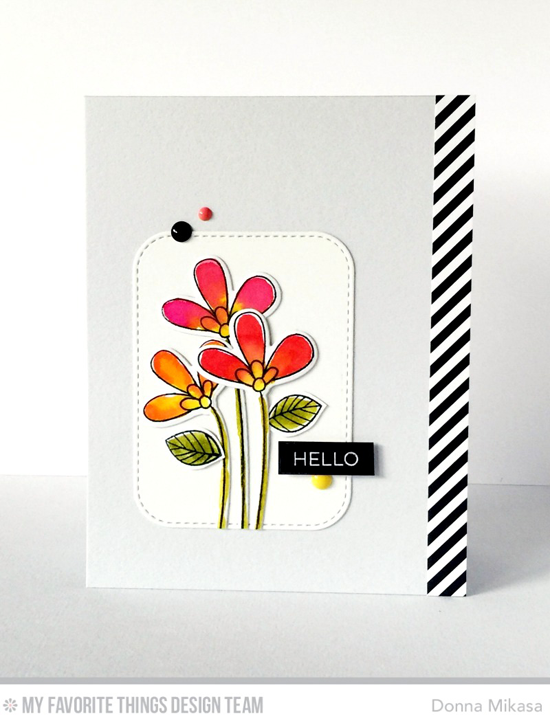 Donna's design features a striped patterned paper on the right like Julie's, but her card is quite different. A simple bouquet of pretty flowers from the Build-able Bouquet stamp set adorns the white rounded rectangle, and three perfectly placed enamel dots are the icing on top of this delightfully uncomplicated design. 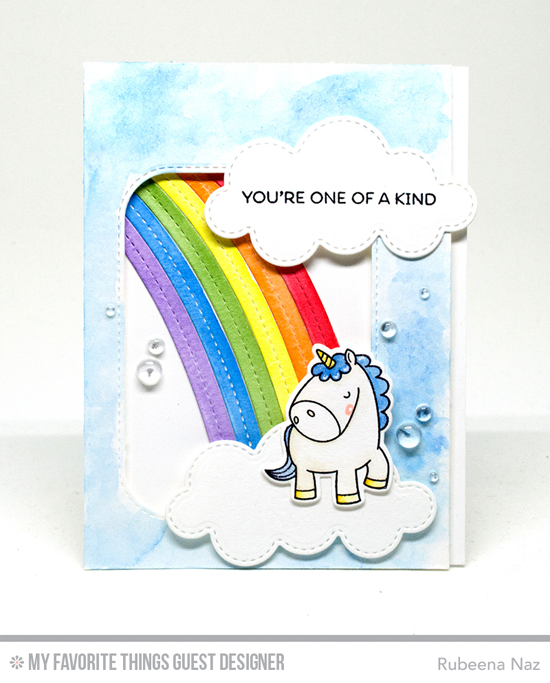 Jody rocks a magical design with the Magical Unicorns stamp set and the End of the Rainbow Die-namics. The saturation is pretty rad, and that multi-colored mane on the unicorn? I can't EVEN. Congratulations, Marlena M.! You are the randomly selected winner of last week’s sketch challenge. You can view all the entries for last week’s challenge HERE. 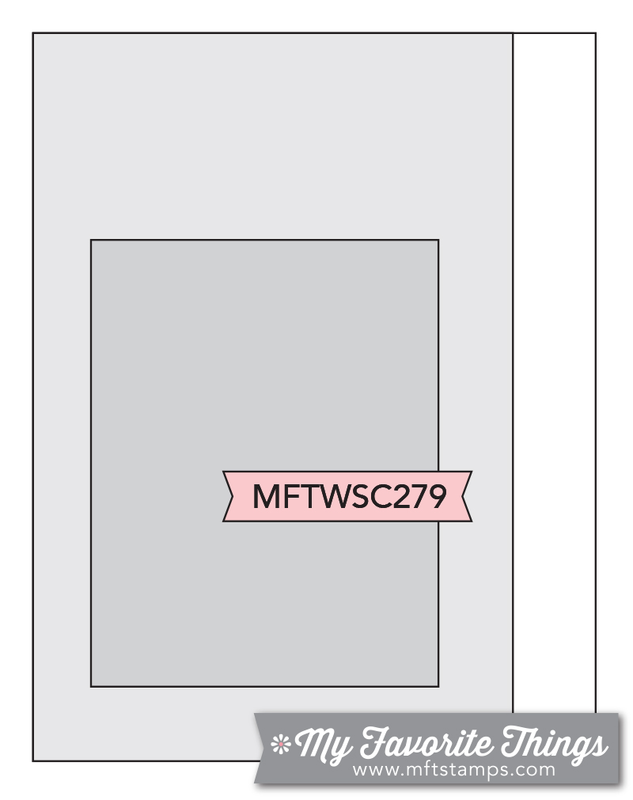 You have until Tuesday, May 10th, at noon EDT to add your link and be eligible for the prize of up to $20 in MFT Cash to be spent in the MFT boutique. Winners are chosen at random, so everyone has a chance! The weekly prize is a $15 Gift Voucher to My Favorite Things, but if you use MFT stamps and/or dies in your project, you’ll receive an extra $5. Thank you for having me, MFT Stamps!! I am so happy to be a guest <3 I love all the inspiration from your fabulous DT! Thanks for the fun sketch and fabulous DT inspiration!